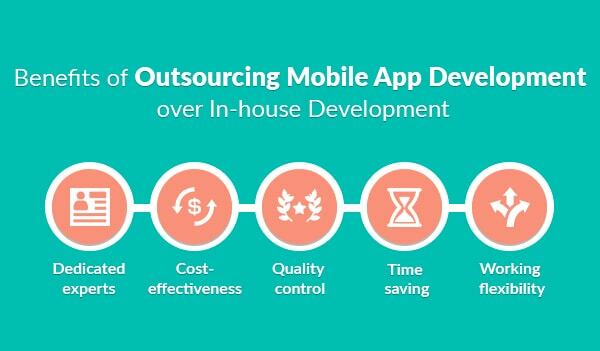 Which is better outsource app development or in-house? If you decide that it's time for your organization to get an application, first question you need to answer is who is going to develop it. The majority of web projects are being outsourced nowadays, and that's not surprising since together with the whole industry, this way of doing business is getting more and more mature. Nowadays mobile app development services are popular as never before. Having a professional mobile app became a real must-have for business owners. Such a demand is due to the fact that users prefer surfing the Internet with their devices, rather than desktops. Mobile applications are being promoted in various ways, like buying cinema tickets with the help of them for less than the price at the ticket office and so on. In fact, people don't really need such calls to action and are increasingly active in downloading apps to their smartphones. The main reason is that using them is awfully convenient, but only if they are user-friendly and constantly maintained and updated. Below we will consider the most important advantages of mobile outsourcing. Since mobile development is a relatively new thing for organizations and programmers as well, quite often it turns out that the team you hire to build an app lacks the necessary expertise. It doesn't mean that they are cheating you, in fact they can be real web masters with impressive baggage of experience. The thing is that mobile developers possess an absolutely different stock of knowledge. For this reason outsource specialists are in the lead, rather than in-house staff, for whom it's just profitless to retrain for other activities so fast. Cooperation with local companies ensures more opportunities to keep in check the project executives. That's true, though the field of distant web development moves on, a vast number of talented experts and demand for their services made a solid base for really professional way of managing work on a remote base. A significant contribution to this have made freelancing platforms. With the emergence of these portals it became possible to hire workers from any corner of the world. Such platforms offer both clients and service providers a comprehensive protection, obligate freelancers to pass tests to give assurances of their expertise, solve possible disputes between parties and much more. This advantage is probably the most decision-making reason for those who favor independent firms. Allowing business owners freely control their limited budgets, this approach is especially common among start-ups. Aside from execution cost, big in-service companies charges include expenses for large IT personnel, various software equipment and so on. Working with full time agencies you won't be able to avoid paying fixed monthly price, regardless the scope of accomplished work, whereas outside contractors give more precise rates and deadlines offering so-called man-hours mode. Remote agencies offer highly adjustable workflow. Very important aspect of working on a development project with overseas experts is time difference. Professional outsource companies provide convenient support conditions to a particular client. Which makes it possible to effectively cooperate anytime, even if you are located in other part of the globe. Such a highly responsive manner of communication, leads to really impressive results. With a fixed budget that you have when dealing with staff firms, there are also fixed steps of the development process. Usually there is a few service packages that include a certain amount of unshakable options. Which means that you'll have a specific number of everything, for instance revisions and feedbacks, and other limitations. Building your application internally is much more flexible. The contract you enter when working with outsourcers, allows tailoring of special conditions just for your needs, that ensures more exact estimate and timelines. A huge popularity of IT technologies embarked on an outstanding army of web masters all over the world. Today we have an opportunity to employ a coder from India and designers from the States at the same time, just sitting on the couch and yet get a seamlessly functioning product as a result! Such specialists have worked on a variety of projects, which is very advantageous, since we can avail from their fresh vision, trends they follow or just share experience and knowledge. If the listed above highlights have only reinforced your desire to come up with outsourcing development of the future application, you might also be interested in a few important points that need to be clarified before hiring an overseas executors. Here's a short guideline on how to proceed. Check for the relevant knowledge that the creation of your app requires. Every reliable agency can freely provide you with a portfolio or a few examples of the similar works they've accomplished. Funny, though it works not only with buying a new kettle. Read what people say about the team you are interested in on third party portals or professional review websites if available. The feedback of a disinterested person is better helper than any advertising posted by the very company. If you have already made your choice, make sure all the matters are cleared up. All the wireframes and other documentations must be properly discussed and approved. Complete understanding of the requirements put forward by both parties, you and the performer, is a half the battle. The security of your project is extremely crucial. 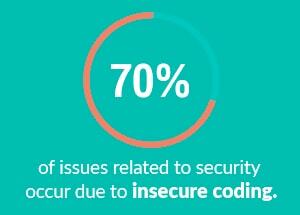 70% of issues related to security occur due to insecure coding. You have to know where the code will be stored during the working process, will you be able to access it anytime, etc. Verify that your programmers apply the most recent technologies and valid coding practices. The more you know, the more you are protected from possible future attacks. Determine the necessary execution phases with your project manager or freelancer, before launching the entire process. This is one of the core elements for stable and productive work of offshore enterprise app developers. Outsourcing app creation to a third party you get a set of hefty benefits, among which time-saving and working process responsiveness. Apart from the points above, make sure your executors provide an ongoing support and maintenance of the products they deliver, since the field of mobile development is moving at breathtaking speed and your off-the-shelf product will require inevitable updates soon. Being able to predict the course of events, you can easily manage effective application for your business and let you target audience have the best user experience ever.